Provided photo Accompanying him to the conference, and present for the awards ceremony, were Upper Valley Superintendent Dr. Nancy Luce, Assistant Superintendent Jason Haak, Instructional Supervisor Roger Voisard, and Cosmetology Instructor and SkillsUSA Advisor Sara Plozay. PIQUA — Jeffery Bertke, Electrical Trades instructor at Upper Valley Career Center, traveled to the National Association for Career and Technical Education (ACTE) Vision Conference in San Antonio, Texas to be recognized as the 2018 Region I Carl Perkins Community Service Award winner. This award recognizes individuals who have used career technical education to make a significant impact on their community and have demonstrated leadership in programs and activities that promote student involvement in community service. This honor is recognizing him as one of the best CTE educators in the country. Bertke is an educator looking for ways to improve the community and involve his students in the process. Bertke and his students were instrumental in transforming a church into a community space. The space and related programming offer mentorship opportunities, a learning center and a school supply pantry. Bertke wrote a Lowes/SkillsUSA grant to acquire supplies for the project, and he and his team rewired sections of the church designated for the learning center. They also painted, decorated, and set up a dedicated wireless network. The community learning center is now a safe and comfortable space for students to come after school to work on homework. He also volunteers with the American Red Cross, SkillsUSA, Big Brothers and Big Sisters, the Cub Scouts, and is Sunday school superintendent at his church. Accompanying him to the conference, and present for the awards ceremony, were Upper Valley Superintendent Dr. Nancy Luce, Assistant Superintendent Jason Haak, Instructional Supervisor Roger Voisard, and Cosmetology Instructor and SkillsUSA Advisor Sara Plozay. 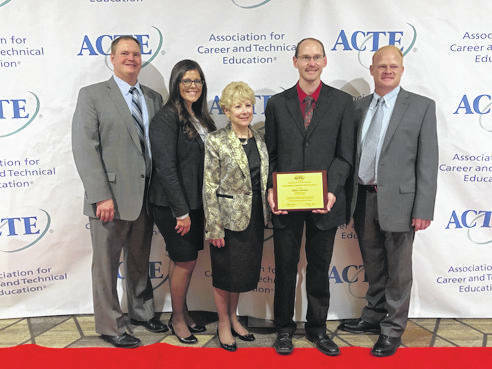 https://www.dailycall.com/wp-content/uploads/sites/30/2018/12/web1_Bertke.jpgProvided photo Accompanying him to the conference, and present for the awards ceremony, were Upper Valley Superintendent Dr. Nancy Luce, Assistant Superintendent Jason Haak, Instructional Supervisor Roger Voisard, and Cosmetology Instructor and SkillsUSA Advisor Sara Plozay.